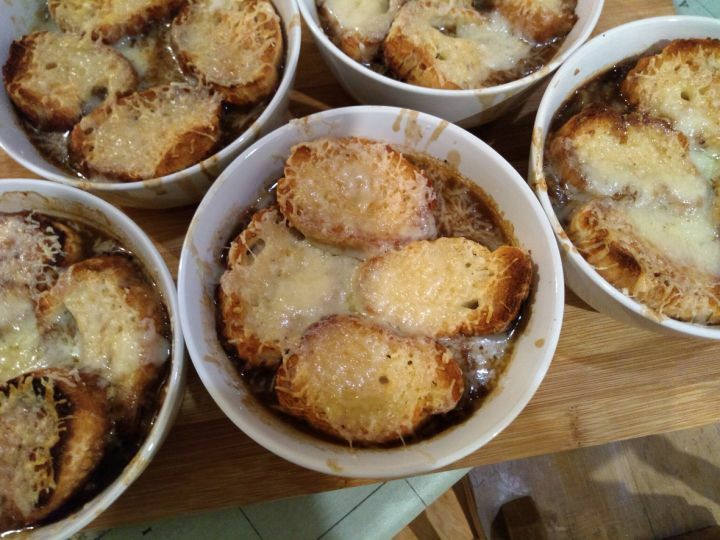 ...or onion soup! A French classic, which I tried the other week. It's easy, warming, and totally delicious! 1.5 litres beef, vegetable or chicken stock(beef or veal is the traditional stock in France) - the quality of the stock will go a long way to determine the quality of the soup! Melt 50g butter with 1 tbsp olive oil in a large heavy-based pan. Add 1kg halved and thinly sliced onions and fry with the lid on for 10 mins until soft. Sprinkle in 1 tsp sugar and cook for 20 mins more, stirring frequently, until caramelised. The onions should be really golden, full of flavour and soft when pinched between your fingers. Take care towards the end to ensure that they don’t burn. Add the 6 thinly sliced garlic cloves and chopped sage leaves for the final few mins of the onions’ cooking time, then sprinkle in 2 tbsp plain flour (use a sieve) and stir well. To serve, turn on the grill, and toast 4-8 slices French bread. Ladle the soup into heatproof bowls. Put a slice or two of toast on top of the bowls of soup, and pile on 140g finely grated gruyère cheese. Grill until melted. Alternatively, you can complete the toasts under the grill, then serve them on top. Enjoy as a starter or on its own for a warming and hearty lunch!